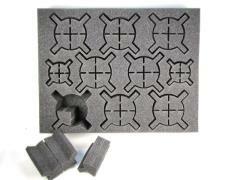 These Iso Trays are the industry's most advanced pluck foam design. They provide the hobbyist with an array of options to quickly customize each Iso cut out. By having the option to remove any one of the four Iso sections you can pluck out exactly the space that your individual model requires. This ensures a snug and safe fit with little to no damage from shipping or general transport. The Iso Trays work with any of the Battle Foam P.A.C.K system bags. You can order this tray in 2 inch (51 mm), 2.5 inch (64 mm), 3 inch (76 mm), 3.5 inch (89 mm) or 4 inch (102 mm) thickness. There are 8x 3 inch (76 mm) circles. 5 inches (127 mm) from point to point and 2x 2 inch (51 mm) circles. 3 1/2 inches (13mm) from point to point. These Iso shapes work with Dreadnoughts, Warjacks, Warbeast, Special Characters or simliar size models.